3D Dot Game Heroes (3Dドットゲームヒーローズ) is an action role-playing video game developed by Silicon Studio for the PlayStation 3. The game is presented using 2D retro-style graphics in a voxel-based 3D environment. The game was published in Japan by FromSoftware in November 2009, and in North America and Europe by Atlus USA and SouthPeak Games in May 2010, respectively. The gameplay resembles that of action role-playing games on third generation video game consoles from the 1980s, particularly that of The Legend of Zelda and Final Fantasy Adventure, and also aesthetically similar to Dragon Warrior. Players move characters from screen to screen exploring dungeons, battling enemies, collecting items and solving puzzles. When the player's health bar is full, the player's sword will grow to tremendous sizes whenever swung. Swords in-game can be customized and leveled up to increase its length, width, as well as magical power, other special items that can also be used include boomerangs, lanterns, candles, and bows. Players can create their own character model using the game's 3D sprite editor. Players are able to collect monsters to be featured in an encyclopedia which is done through beating the monster on its head with a book until its profile shows up in the encyclopedia's pages. Loading screens in-game feature recreated box arts of classic video games using the game's 3D sprites. The game follows a hero on a quest to rid the Dotnia Kingdom of a dark plague caused by the forces of evil in order to restore peace to the land. Legend tells of an evil king known as the Dark King Onyx who brought tragedy and darkness to the kingdom by stealing six magical orbs. However a hero rose up against the Dark King and with his legendary sword as well as the power of the orbs, he sealed Onyx away within another orb. However, the forces of evil rose again as the Dark Bishop Fuelle stole the orb and threw the Kingdom of Dotnia into a state of chaos once more. The game's main protagonist is the grandchild of the brave hero who sealed away the Dark King and thus is entrusted with the responsibility to save the land. The kingdom was once a 2D pixelated world but as the King of the Land felt that sprites were outdated he thus decreed for the kingdom to make the switch to 3D. This caused the entire world to become 3D while still retaining its original pixelated look. The game was teased by From Software on August 10, 2009 with a teaser site showing a cube and a countdown-timer to August 20, 2009. The game was unveiled before the countdown ended by Japanese gaming magazine Famitsu, on August 18, 2009. A North American release of the game was confirmed by the Twitter account of Sony Computer Entertainment America which said that the game was "definitely" coming to North America. On November 17, 2009 Atlus confirmed that they would be localizing and publishing the game in North America for a May 11, 2010 release. The game received a generally positive reception from critics. Famitsu gave the game an 8/8/7/7, a total of 30 out of 40, saying that the gameplay is a huge homage to The Legend of Zelda and there are numerous references to Nintendo Entertainment System games throughout the game, making it a "nostalgia-laden trip." Famitsu also praised the graphics saying that the blocky animations are pretty and that they fuse the old with the new seamlessly, also saying that it was a fun and well-made title, though it does not qualify as a new and original game. According to Famitsu magazine, 3D Dot Game Heroes sold 17,300 units in Japan by the end of 2009, making it the 463rd best-selling game of the year in that region. 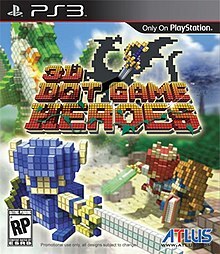 Atlus USA reported in October 2010 that 3D Dot Game Heroes sold 160,000 units, greater than six times the amount they had anticipated. ^ "3D Dot Game Heroes gets UK release date". GamerZines. February 10, 2010. Archived from the original on 2010-02-13. Retrieved 2010-02-10. ^ "PS3 Getting 2D Hero In 3D Game". Kotaku. 2009-08-20. Retrieved 2010-05-14. ^ "3D Dot Game Heroes "Definitely" Coming To America". Kotaku. 2009-10-27. Retrieved 2010-05-14. ^ Spencer (November 16, 2009). "Atlus Dates 3D Dot Game Heroes For North America". Siliconera. Retrieved 2010-05-14. ^ a b c Ryan Clements (November 17, 2009). "3D Dot Game Heroes Preview". IGN. Archived from the original on 21 November 2009. Retrieved November 21, 2009. ^ a b John Tanaka (August 18, 2009). "From's New PS3 Title". IGN. Retrieved November 21, 2009. ^ Anoop Gantayat (August 10, 2009). "From's Latest Tease". IGN. Retrieved November 21, 2009. ^ Sony PlayStation (October 27, 2009). "No need to import – 3D Dot Heroes for PS3 is DEFINITELY coming to NA!". Twitter. Archived from the original on October 30, 2009. Retrieved November 21, 2009. ^ Atlus (November 17, 2009). "Atlus Links to Legends Past, Announces 3D Dot Game Heroes for PlayStation 3". IGN. Archived from the original on 19 November 2009. Retrieved November 21, 2009. ^ "3D Dot Game Heroes". Metacritic. Retrieved July 15, 2013. ^ Valay (August 7, 2010). "The top 1,000 best-selling games in Japan for 2009 (Famitsu)". Nintendo Everything. Retrieved 2016-07-01. ^ Spencer (October 21, 2010). "3D Dot Game Heroes Sells Six Times Expectations, Demon's Souls Does Double". Siliconera. Archived from the original on 23 October 2010. Retrieved 2010-10-22. This page was last edited on 22 January 2019, at 02:47 (UTC).